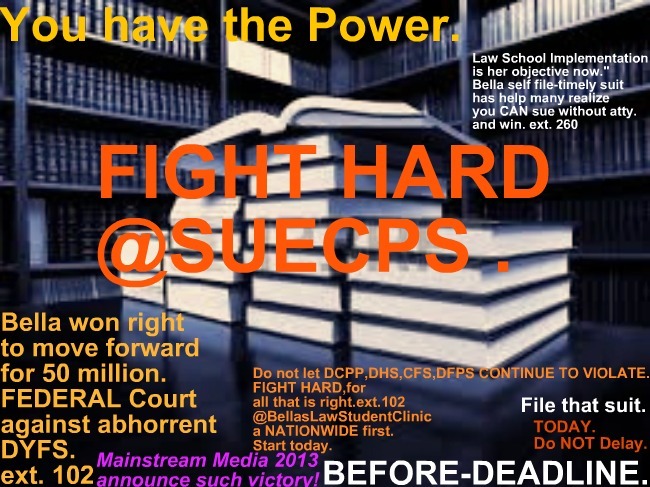 From Texas violation by DFPS to Illionois caseworker,at CPS to Georgia DFCS,North Carolina DSS,South Carolina,to West VA....Such inequities are prevalent when it come to your right to your child,grandchild,family involving child protection services;ergo your time to sue however as case law support is quite limited;hence take the prerequisite ACTION today to begin. Ignoring such statute,leaving your child once happy,healthy prior to removal in continual-harm's way. Your suit has to be filed against caseworker timely.No Delay... ext.102. U.S.C.A.Title 42-Section 1983;85 et'al. 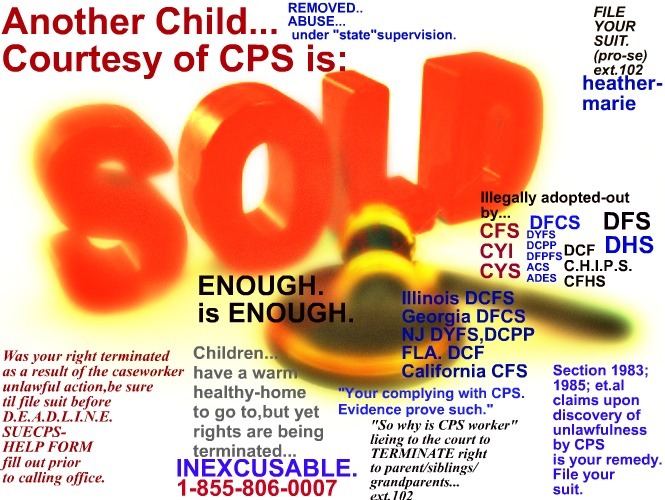 is your remedy when violated by child protection services.Until BELLAS PRO-SE EXPERTISE CONSULTING/PRO-SE SELF FILE Center,verifiably so many had really no idea where to begin or how...leaving so many worldwide vulnerable to the unlawful daily inequities by C.P.S. ext. 102. Be sure to institute your lawsuit immediate,within the time allotted by law. Do not wait until your deadline,indeed shall arise leaving you at "that moment"
1 of a kind support ctr.website or on any page on this site to begin same-day. Once your suit is filed by YOU, the pro-se injured party such lawsuit damage(s)will be fairly considered in a court of law,FEDERAL. along with your constitutional right;DUE PROCESS. Federal Court,listened to owner/founder and her girls,and now has awarded them the RIGHT as media validate to simply move forward. Inspiration she is to many,as she continue to seek the procurement of her law degree in due course.EXT.102 ask for heather-marie to begin.